Come join Pam and Emily along with 27 experts and learn about research, parenting, health and wellness, as well as parenting your child and teen at The Children’s & Teen Health Summit. It’s online and free this week only. Due to poor diets and fast lives, our kids are becoming ill at an alarming rate! If we share information and lend support to each other, we can do something about it. 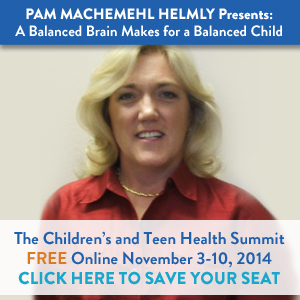 Learn more at The Children’s & Teen Health Summit, online and FREE from November 3-10, 2014! Register for free Register now! Carla Atherton created The Children’s & Teen Health Summit for parents, caregivers, and the children and teens they care for. This free, online event will address a diverse buffet of topics during a week of interviews with leading experts in many health fields. Empower yourself and your children! Tom O’Bryan, “Is Gluten Destroying Our Children’s Brains and Bodies?” Dr. Tom O’Bryan is the gluten expert. Dr. Dan Siegel, Neuropsychiatrist, Mindsight Educator, Interpersonal Neurobiologist. Guru in all things parenting, trauma, and development. With 27 expert presentations, the Children’s & Teen Health Summit is a wealth of knowledge you do not want to miss! This invaluable (and FREE) resource is intended for parents, children, and teens everywhere! 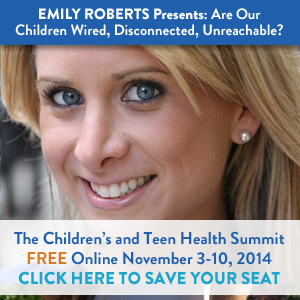 Come listen to The Children’s & Teen Health Summit for FREE and be inspired from November 3-10, 2014! Register for FREE today: Register!